It is weird today. A nice weird. I usually do up holiday dinners and we have a crowd of some kind come over. But this time we decided to just have it be us and not make a big deal out of it. I am going to cook today – Cornish hens with wild mushroom and wild rice stuffing, roasted brussel sprouts, candied yams, and blueberry pie – but we aren’t cleaning or doing much of anything except lazing around by the fire reading. I’ve already called my family and so the day is entirely ours to enjoy. I’ve gotten through the odd blip at work and have this amazing perspective. I took a day to think about things, came up with a plan, and laid that plan out thoughtfully and I am in a comfortable place. I am infinitely grateful for my life, and my job, and so many things in life. Most of all I am grateful for Mike. We support each other and love each other but the greatest part of our relationship is how much we laugh. So much laughter. 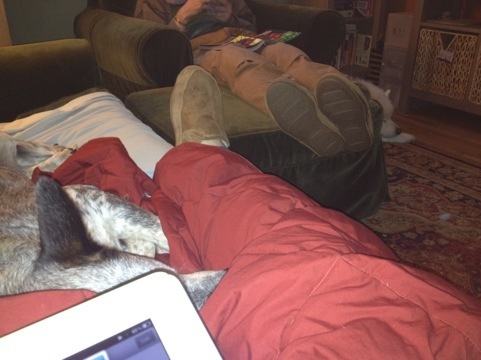 I am sitting here typing this up and I have one of our dogs cuddled up with me; across the room is Mike reading his blogs and laughing out loud every so often with our other dog curled up next to him. It is such a blissful moment and I am taking the time to notice it and savor it. Well that’s awfully sweet my dear. Thank you – I’m damned grateful for you and the two furry wonders as well.